It might be hard to remember a time when getting one’s mug on the Internet involved more than just point, shoot and upload, but it was only 10 years ago that we came stumbling out of the Dark Ages and into the light of web videos for all, where we promptly posted whatever the heck we wanted to YouTube for strangers to watch. To that end: The first video ever uploaded, 10 years ago today, features thrilling commentary on the nature of elephants. 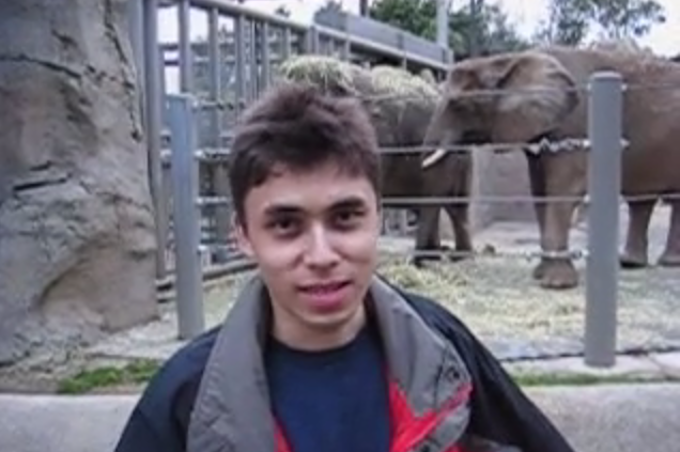 On April 23, 2005, YouTube cofounder Jawed Karim uploaded an 18-second video clip titled “Me at the zoo,” making it the site’s first video. It now has more than 19 million views which is respectable, to be sure, but it’s no “Gangnam Style,” which clocks in at more than 2.3 billion views. According to CNBC.com, it was shot at the San Diego Zoo by fellow co-founder Yakov Lapitsky. The year after that fateful upload, Google acquired YouTube for $1.65 billion, which was the company’s second largest acquisition at that time, making its founders multimillionaires. Spoiler alert: The “cool thing” about elephants will not blow your mind or change your life. But you do have endless hours of cat videos to watch so, it is what it is. Previous Which Beauty Subscription Boxes Are Actually Worth The Monthly Fee?